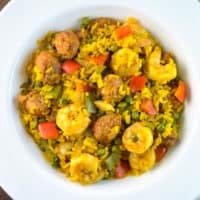 This Shrimp and Chorizo dish is perfect for when you want all of the flavors of a paella, but not enough time to do it. It’s totally enough to impress all your friends too and easy enough to do after work. 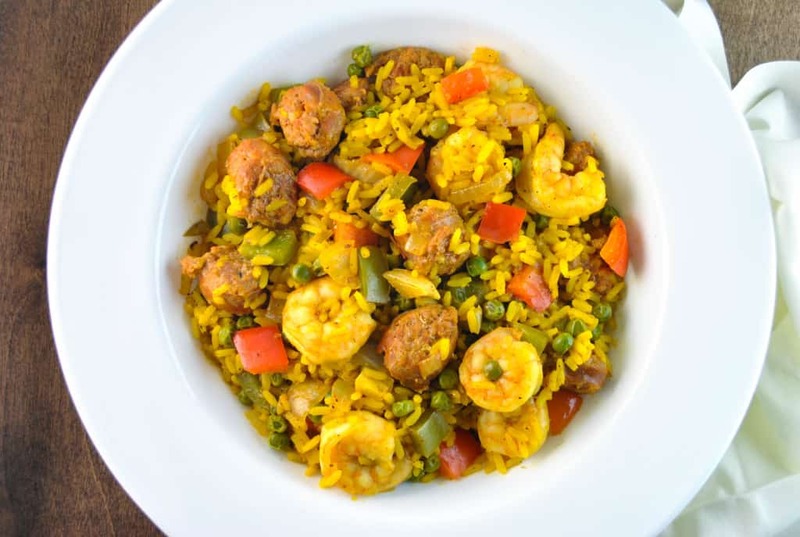 A paella usually has a toasted layer of rice on the bottom of the pan called a socarrat which gives it a more complex texture and flavor. 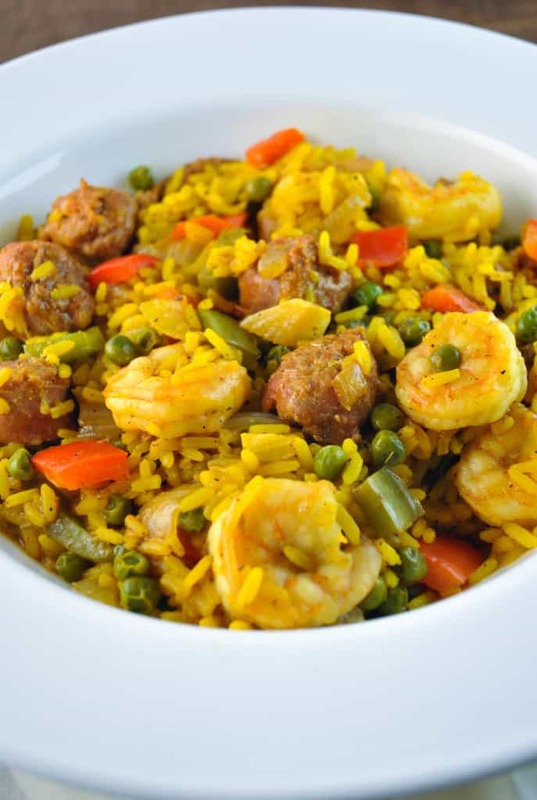 While this dish is missing the socarrat, it’s a great starter dish to learning the flavors of paella. That yellow rice ??? Admittedly not as good as if you were to actually use saffron, but sometimes you just need to cut corners to eat well on a weeknight. 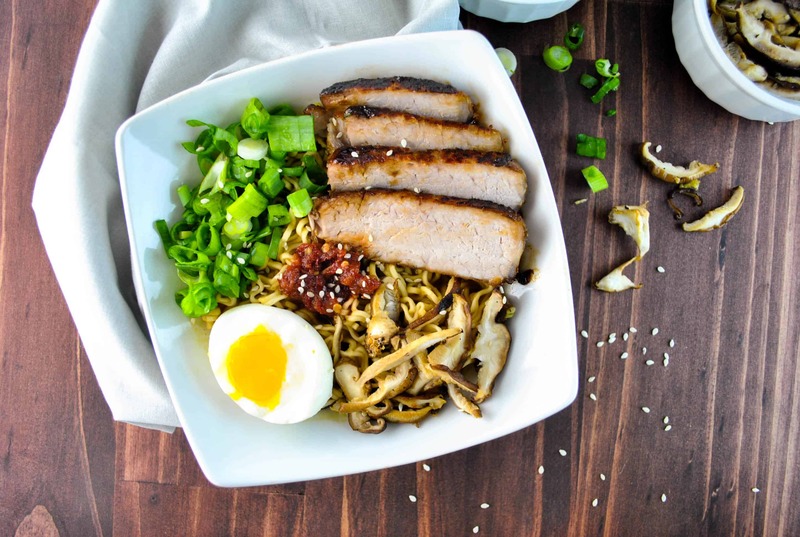 This dish is even good as leftovers. I had this the next day for lunch and it develops an awesome heat from the chili powder and paprika with the spices from the chorizo. Cook rice according to box. In a large skillet, cook the chorizo until done over medium heat, about 10 minutes. Move to a plate once done. Add peppers, onion, garlic, and peas with the chicken broth and white wine into the skillet and cook until peppers and onions are tender, about 10 minutes. Add shrimp, pepper, salt, garlic powder, chili powder, and paprika and cooked until shrimp are pink, about 2-4 minutes. Slowly mix in cooked rice and chorizo until well incorporated and let sit for 5 minutes.